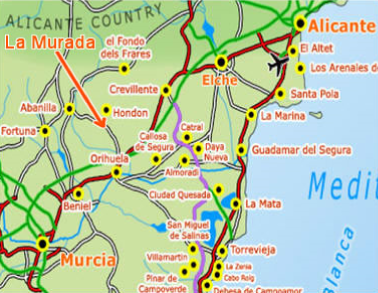 La Murada is in the Alicante province but sits on the Murcia border, the ideal spot to explore both regions and the Costa Blanca. Airports; Alicante. Just 35 minutes drive (50km). Cavera Murcia. 55 minutes. La Murada is famous for its Sunday market, which stretches through many streets with a vast array of different things to buy. All the bars and restaurants are open which makes for a special Spanish day out. The Olive Mill is set in the countryside, but don’t worry Google Maps will bring you straight to our door. Car hire is recommended, we advise www.laracars.com. No hidden costs or hassle. When booking at The Olive Mill, please ask us for our discount code. We can offer you airport transfers from Alicante Airport. An ideal location for cycling, walking and bird watching. Beautiful countryside, mountain views and expanses of lemon & orange groves. Being on the border means it is easy to explore both regions and we boast 330 days of sunshine each year. At The Olive Mill we offer just what you are looking for, the perfect holiday. Call us on 0034 966 180 894 or email here.